Efflorescent Interference, Sarina Villareal’s current exhibit at the Gallery at Library Square, explores the fine balance between the control one has over one’s life and those things out of one’s control, between what can be gained and what can be lost by life in the world. With paintings that are abstract and figural, concrete and amorphous, she expresses this existential struggle that happens with all of us as we live, remember and form our personal concept of the self. A native of Houston, Villareal attended Kingwood College outside of that city, where she earned an AS in graphic design, followed by a BFA in painting from the University of Houston. 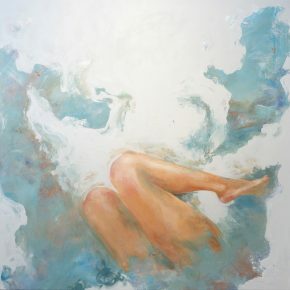 The artist says, “I’m into psychology, how the brain works, neuropsychology, with portrait and figurative work.” Her works shift from semi-abstract to complete abstraction, exploring existential and psychological theory, structuralism and the nature of being and the vast territories of the mind with much room still for understanding and learning. She’s represented locally by 15th Street Gallery and in an exhibition she had there in September she exhibited works marked by experimental abstraction, with elements of flux, the plasticity in what might appear intangible. Her abstract gestures of color and form appeared to coalesce into floral motifs without ever fully departing from their abstract nature. 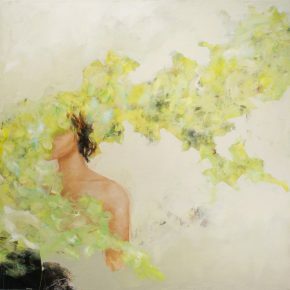 “With this show,” she says of her current exhibit at the library, “I wanted to bring back the figure and integrate what I have been doing.” Memory is Villareal’s source material, and with paint she explores how ideas and images shift… how experience is conceived and distorted over time and what is ultimately retained. “Working from memory; the florals and the figures are what I like best. 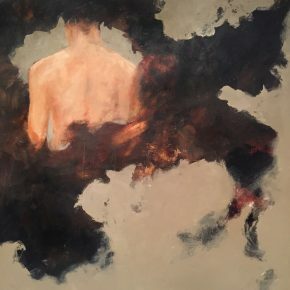 The first works I did were abstract figures, so I wanted to get away from relying on the figure, allowing for more liberty in thought, of what we think now and what actually was, and how this is processed.” This ubiquitous gestural play of figure and abstraction allows for a liberty of freedom as the duality of flourishing and a suffering in the awareness of being caught, helpless between beauty and truth, authenticity and lies. The exhibition title’s reference to efflorescence, the crystallized accumulation of salt crystals on a surface, evokes this sense of what is left behind, a stasis that accumulates from a flowing source that solidifies and hardens, but also blossoms and flourishes. 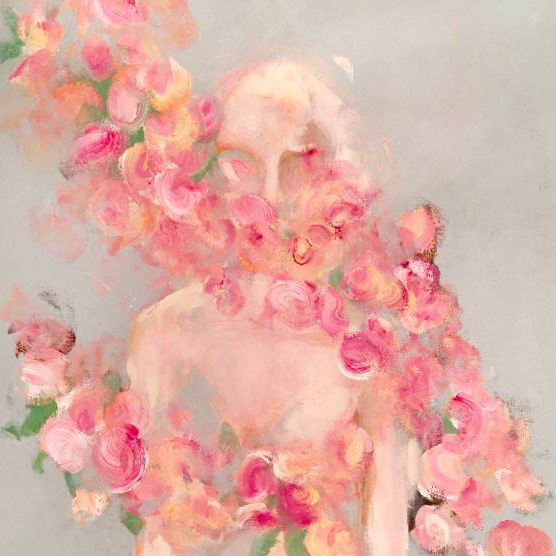 In “Rose Fragment,” one of the 12 canvases on exhibit, the concept is brought to fruition with what may be an ethereal beauty. Villareal terms these works “florals,” and in this work her abstract mark-making explores nuanced shades of pink, orange and red, evoking without ever delineating floral motifs. Blended into this floral motif is a figure, rendered in light strokes, partially crystallized, an apparition, with mouth stifled… expressing the passing of time, memory, in conflict with an uncertain, current state of awareness, or unawareness. One can feel the conflict of reality in “Interference in Black,” where the figure has her back to the picture plane, but she also has her back to the ugliness of the world represented by a dark chaotic amorphous matter. She is searching for beauty and truth, authenticity but not lies; the only conflict is that which resides within the personal place of self. Being one’s self in one’s social environment is a process of “getting along.” In life there is no contract to be signed or course to be taken, no uniform or prearranged formal relationships. Yet life is a challenge, and the complex nature of our psychological selves, how we construct our idea of the self and the world, through the accumulated memories of our experience, makes it even more challenging, if also, as Villareal expresses in this exhibit, more enriching.